This example shows how to serve data from an analog input via the Yún device's built-in webserver using the Bridge library. Prepare your SD card or USB Flash memory stick with an empty folder in the root named "arduino" and a subfolder of that named "www". This will ensure that the Yún device will create a link to the memory to the "/mnt/sd" path. In this sketch folder is a basic webpage and a copy of zepto.js, a minimized version of jQuery. When you upload your sketch, these files will be placed in the /arduino/www/TemperatureWebPanel folder on your removable memory. You can then go to http://arduino.local/sd/TemperatureWebPanel to see the output of this sketch. You can remove the SD card or USB Flash memory stick while the Linux and the sketch are running but be careful not to remove it while the system is writing to it. Attach a TMP36 temperature sensor on A1, and insert a micro-SD card into the slot on the Yún or the USB host of the shield. Instantiate a server enabling the the Yún to listen for connected clients. Create a string to hold the time the sketch started, and a variable to keep track of the number of times the page has been visited. In setup() , start serial communication and Bridge. It's helpful to use the on-board LED as a status light to know when Bridge has started. 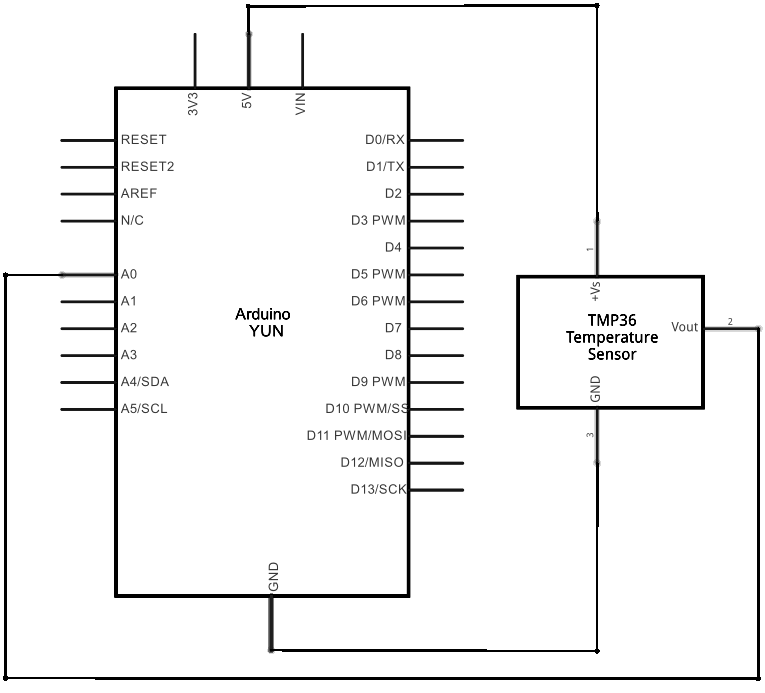 Set A0 and A2 as power and ground for the TMP36 sensor (this helps avoid using a breadboard). Create an instance of Process to get the time the sketch started by running the date command and storing it in the string you created earlier. In loop(), create a named instance of YunClient to get any clients coming from the server. If there is a new client connected, read the command the client sent and print it out. If the command is "temperature", get the current time and read the value of the temperature sensor. Print the current time, temperature, time the sketch was started, and the number of hits since starting to the connected client with client.print(). Close the connection to free up any unused resources and increment the hit counter. via the YunShield/Yún built-in webserver using the Bridge library. This sketch must be uploaded via wifi. REST API must be set to "open". named "arduino" and a subfolder of that named "www". will be placed in the /arduino/www/TemperatureWebPanel folder on your SD card. to see the output of this sketch.